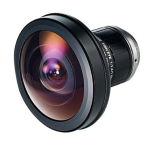 Apply this fish-eye lens when you need to image a large area from a close distance. The F-theta design delivers uniform images. Thumb-screws lock down both focus and aperture. When mounted on a 1.0 format sensor, the camera will image a 185 degree cone. The circular image inscribed within the rectangular sensor will, by design, exhibit extreme vignetting. A 2/3 format sensor images 185 x 140 degree cone with less vignetting. A 1/2 format sensor images 136 x 102 degree cone, with little to no vignetting. We have a link to sample images on the Resources tab.